With the popularity of this show, I can’t see it ending anytime soon; but for the foreseeable future, we know there will at least be two more seasons. Grab The Big Bang Theory: The Complete Tenth Season to add to your collection! For the past ten years, the television show The Big Bang Theory has made us laugh. With a renewal for at least two more seasons, we can rest assured the gang will all be together and geeky as ever. This group of "scientists" has taught us more than we ever thought they could and has made being a nerd seem almost cool. With Season 11 about to begin, we can now take a look back at all the hilarity of season 10 as it hits stores on Blu-ray and DVD. The Big Bang Theory: The Complete Tenth Season saw some significant changes for everyone. Sheldon (Jim Parsons; Garden State) and Amy (Mayim Bialik; Blossom) temporarily moved in together, Howard (Simon Helberg; Good Night, and Good Luck) and Bernadette (Melissa Rauch; True Blood) welcomed Baby Halley to their lives and Raj (Kunal Nayyar; Sanjay and Craig) examined his former relationships while trying to learn to be independent from his father's money. Of course, Leonard (Johnny Galecki; Roseanne) and Penny (Kaley Cuoco; 8 Simple Rules) still have their share of relationship problems that manifested in different scenarios throughout the season. Of course, adding a baby into the show not only changes the dynamic for all of the cast it also lends itself to some hilarious moments. One of my favorites was when Howard and Raj created an elaborate grid in Halley's room to avoid the floor squeaking and waking her up. The task was handled in a true scientific format that was completely impractical in the long run. We also were taken along on the continuing ride that is Sheldon and Amy's relationship. I desperately try to root for them every season so Sheldon can have some sort of semblance of a normal life plus their scenes are generally funny. Once again, the writers took us on a roller coaster with these two having them move in together only to watch Amy move across the country to the finale when Sheldon proposes. Of course, we are left hanging to wait ALL SUMMER to find out what her response will be although I suspect, even if she says yes, things won't be a smooth ride to the altar for them next season. It's almost amazing in today's age to have a show maintain its popularity ten seasons in but it's a testament to the writing that fans keep coming back. The dialogue is sharp and the jokes stay fresh, probably partially due to a limitless number of science-related jokes that can be made. For the layperson, these intellectual moments are things they may not have heard of be aware of before. The Blu-ray has 1080p video quality with a 1.78:1 aspect ratio. There is little to no video noise and the colors are true and strong. The DTS-HD Master 5.1 audio is clear with the dialogue relegated to the front channels and the audience reactions coming from the sides and the rear. The extras are spread over both discs and include Best of The Big Bang Theory 2016 Comic-Con Panel, #JustAskBBT, The Ever-Expanding Universe of The Big Bang Theory, Mad Props, Who's the Baby Now?, and the Gag Reel. They are all fun to watch and offer some interesting tidbits. With the popularity of this show, I can't see it ending anytime soon; but for the foreseeable future, we know there will at least be two more seasons. I, for one, am excited to see how they handle Sheldon's proposal! 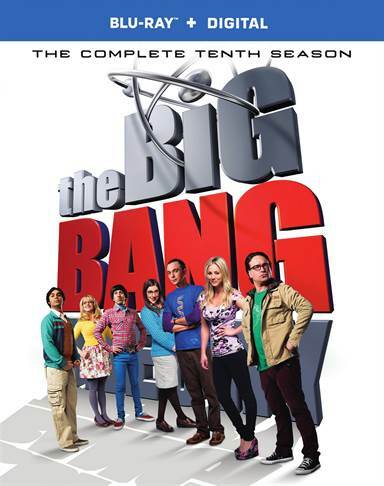 In the meantime, grab The Big Bang Theory: The Complete Tenth Season to add to your collection! *As a side note, don't forget to watch the new spinoff series Young Sheldon this fall! Download The Big Bang Theory: The Complete Tenth Season from the iTunes Store in Digial HD. For more information about The Big Bang Theory visit the FlickDirect Movie Database.